Migos's Takeoff and Offset at the 2017 BET Awards. Photography Johnny Nunez/Getty Images. why are those white oval sunglasses everywhere? How 2017 became the year of "clout goggles." In spring of this year, a pair of buggy white sunglasses began to flourish. A curved bridge connecting two swoopy ovals: in a certain light they looked like the infinity symbol floating around a face. In another light, they looked liked an oversized pair of child’s beach glasses. During one Coachella weekend in April, both Migos’s Takeoff and Pharrell wore them for their shows. Takeoff then wore his version to the Met Gala. The pair made by Acne Studios sold out in the first day it arrived at Opening Ceremony. Fresh and bright, with a new-looking shine, these white sunglasses are the very look of 2017. They are also the very look of 1993, of Kurt Cobain in his most iconic portrait series. He kept the pair wedged over his eyes and famously never took them off for the entire daylong shoot, chewing on his chipped red manicure. Now, in December, when I type “Kurt Cobain” into my search browser, the word “glasses” is the first autofill suggestion, followed by "death,” "quotes,” "daughter,” and "documentary.” What a moment for Cobain’s legacy: the biggest curiosity about him is a cover-up for an evident hangover. Photographer Jesse Frohman remembers Cobain coming down three hours later than expected for the shoot, wearing those big glasses, and asking immediately for a bucket. “'Sure, we have a bucket. What do you need a bucket for?’” Frohman recalls, in an interview about the images with Rolling Stone, “And he said, '’Cause I think I'm gonna puke.' And that was my introduction to Kurt." The photos of him on that day in November 1993 — striking on their own, a moving portrait of reticence, resentment, hangover, ecstasy — were part of many people’s introduction to Cobain’s image. 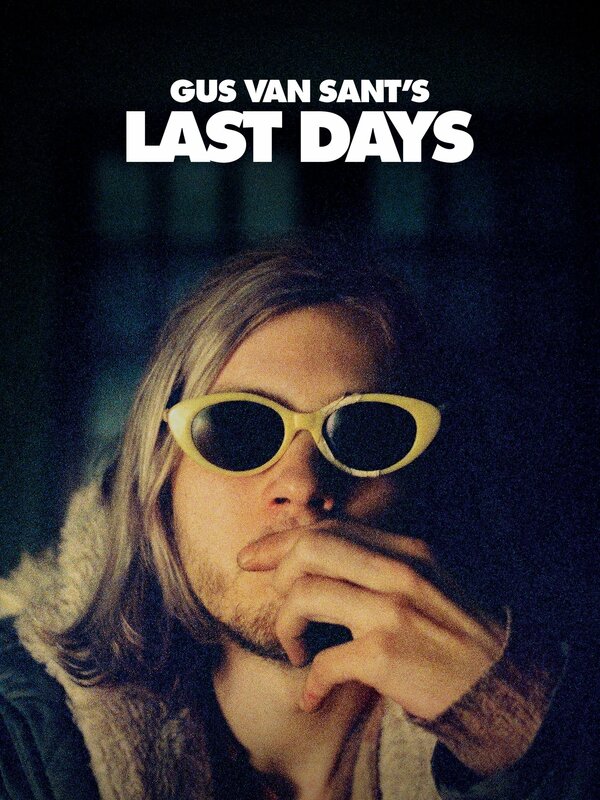 The poster for Gus Van Sant’s Last Days (2005), the Cobain-ish final moments movie, centers the glasses as the star. Lil Yachty at the 2017 MTV Awards. Photography Kevin Winter/Getty Images. There is something about these sunglasses’ glaring whiteness, their size, their color-blocking effect, that seizes your eye. You see sunglasses, then the face behind them, then the full picture of everything together. Though they have a crystallized place in 90s grunge, the accessory was an offbeat choice for the era’s most prominent alternative musician. Frohman calls them “Jackie O” glasses, glamorous and very 60s. Before Cobain, the most memorable white sunglasses model was prim-chic patron saint Audrey Hepburn in Oliver Goldsmith’s round frames. 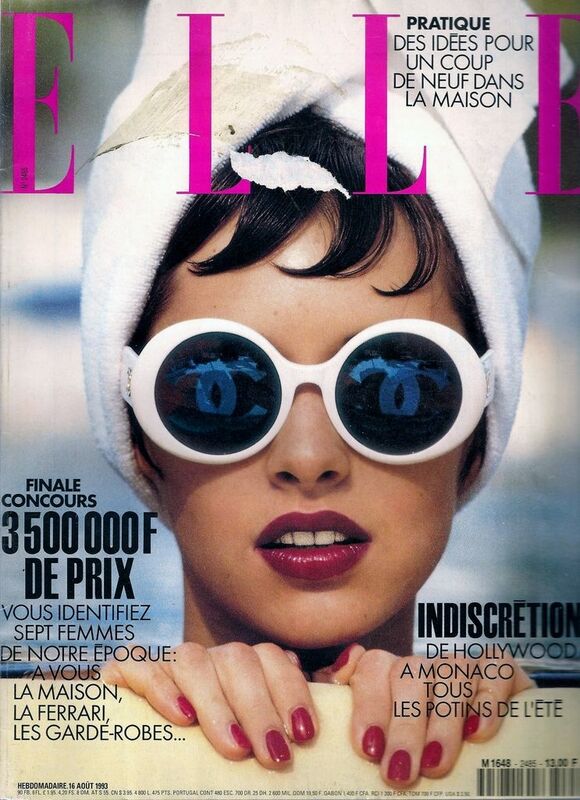 A few months before Cobain’s seminal photo shoot, a pair of big white sunglasses had appeared on the August cover of French Elle, also worn by a human with a blood red manicure, though hers is distinctly unchipped. They are a flashy shade and bold shape, diametrically opposed to the dirtied faded clothes of 90s alt-rock. It’s a misfit choice. It adds to the haphazard combination of can’t-be-bothered independence and I-can-get-away-with-anything arrogance. The eccentric young rappers of 2017 use the glasses similarly. As they navigate from the underground into the mainstream, they are bringing along this talisman of another musician who made the move before them, with ambivalence, irreverence, and sincerity. There are thematic links between the SoundCloud rap crowd and Cobain’s motifs of nihilism, depression, self-destruction, distressed denim, and chin-length hair (today, dredded and brightly dyed). Takeoff’s verses often seem to be a list of dulling agents to get him through the day; Lil Uzi Vert’s most sinking hook is a suicidal plea. But then, remember Pharell in white oval Chanel shades singing “Happy” at Coachella. The glasses have also been worn by it-kids, fashion kids, and musicians of all types: Mike Will Made It, Gucci Mane, Harry Styles. There are a range of vibes. There is push-back, even, against calling these Cobain glasses, or glasses at all. In June, rapper Denzel Curry declared definitively, “These ain't glasses, baby, these are Clout Goggles.” If you wear these glasses, now, you’re speaking the language of media prestige. In 2017, the glasses have become so beloved by young rappers hungry for followers (for “clout”), they’ve become a meme. But “goggles” have always been worn by people with a whole lot of look. On the day Cobain was photographed in them, he was also wearing a grey fleece trapper hat and a leopard-print jacket. Lil Yachty has worn them with a Mickey Mouse sweatshirt, diamond bracelets, and camo shorts. They are so large and goofy, they are at their best when worked into a maximalist ensemble: when you have too much going on and then add one more thing. This shape of frame is often also called the “alien” style and it does create a bulbous forehead-expanding effect that seems to imply both a larger brain and a goofy soul. They are bug-eyed, not a human proportion; they’re not of this world or time. As with all bold sunglasses, they are also a paradox. They are eye-catching but evasive. They conjure the energy of an artist who is perhaps a little too sensitive for fame. Frohman, again, on Cobain’s white sunglasses day: “You know, he's a handsome man, he's got his eyes full of expression. Those pictures are different, and they're interesting. But to me, there's something about these pictures that transcend connecting to a person.” Sometimes the best way to make a connection is to be indirect about it. Sometimes you’ve got a terrible light-sensitive hangover. Either way, huge white sunglasses are a godsend.